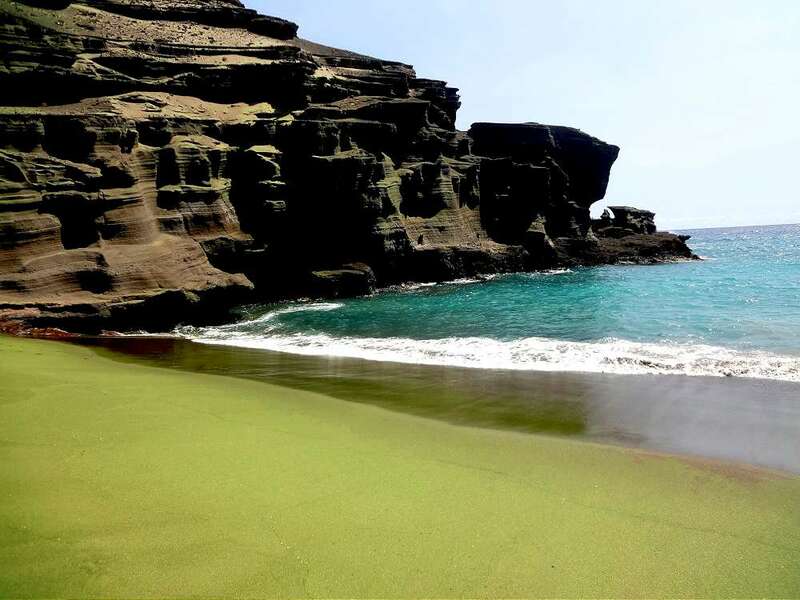 Near the south end of Hawaii’s Big Island, which is the southern-most spot in the United States, is Green Sand Beach. It’s a magical spot — and secluded. Unless you have a 4-wheel drive vehicle, you need to walk 2.5 miles from the closest decent road. When first come to the end of the path and get to the edge of the cliff, you almost can’t believe it. You survey a beautiful horseshoe-shaped bay, ringed by rocky cliffs, with the bluest water washing ashore on a perfect sandy beach. Then, you have to clamber down the rocky cliff to get to the water. But it is so worth it. The sand is literally green. Some miracle of volcanic rock formation has created just the right conditions for this little beach to have the most beautiful olive green sand. The day we were there was perfect. Hot and sunny. With a nice strong waves coming in, perfect for body surfing. I tried to go with the flow of the waves and was body slammed into the surf more than once. It was so much fun, I didn’t care that the waves were having their way with me. I had green sand coming out of my ears for a month. We learned that clothing was optional at Green Sand Beach. It’s so remote, who’s going to care? Or enforce rules? And, of course, it led to haiku. Even the sand is green! not on Green Sand Beach! Love these memories of Hawaii. The second one, that ends with “Thirty years ago” is a really great haiku. Thanks. Not sure it was a satori moment, but I felt pretty good writing it. Yeah I love how the last line changes the meaning of the first two and leaves your current stance ambiguous.